One week of CampNaNoWrimo left to go, and I'm only 5k away from meeting my self-set target of 20k in the month of July. I'm so pleased with how things are going. 5k a week Mon-Fri was the exact right amount for me. I don't feel burned out, I'm still enjoying the story, and I feel like I'm making good progress, instead of feeling like I've achieved nothing. 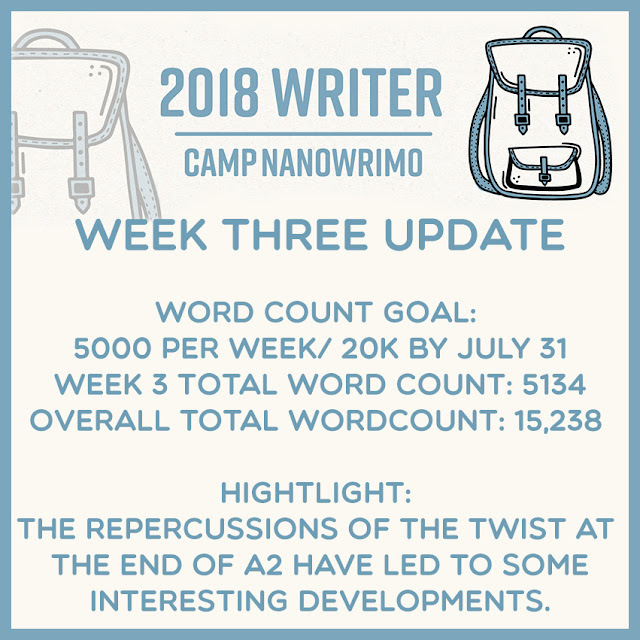 This week's highlight was the repercussions of the twist at the end of act two leading to some interesting developments for one of my main characters. I'm also setting up conflicts for the other two MCs to battle with before the climax. I'm so excited to finish this story. And I only have another 15-20k to go, as I broke the 70k mark today. My aim is 95k max for the story, and I will probably work on the final 20k in September. I say this as I'm taking August off not only to avoid burn-out, but to enjoy the summer school break with my sons, and head to the beach for a vacation! So that was my positive writing week. How are things going for everyone else? Let me know in the comments, and until next week (when I'll hopefully be reporting making it to 20k) have an excellent week!